Intelligent RM Series P.F. Controllers are used for measurement and control of P.F. 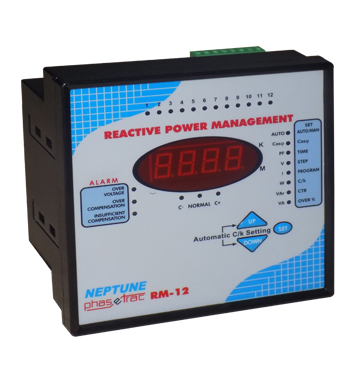 control units for central reactive power compensation. The P.F. 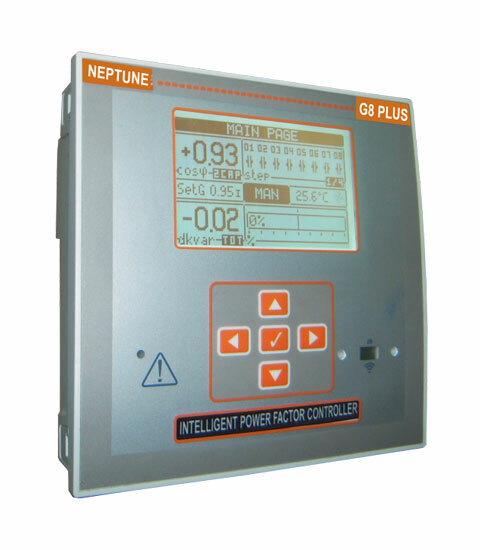 measured by Neptune RM Plus is compared with the set values and in order to provide necessary compensation. P.F. Controller switches capacitor banks ON & OFF automatically. RM Plus is Single Phase CT Sensing micro controller relay, designed for above application in 144×144 case for flush mounting with rear plug-in connectors. Microcontroller based programmable RM Plus series relays are manufactured with 8 & 12 capacitor steps. It can work either in automatic or manual mode. Automatic disconnection of all capacitor steps in case of Mains failure over 20 sec. Time Delay Between Steps 1-1.800 Sec. (for switch on / off separately) Discharge Time (Reconnection Time) – 1-1.800 Sec. Power Factor Controllers are used for measurement and control of power factor control units for central reactive power compensation. 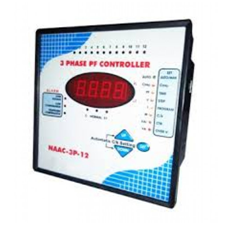 The Power Factor measured by NAAC-3P is compared with the set values and in order to provide necessary compensation. Power Factor Controller switches capacitor banks ON and OFF automatically. NAAC-3P is 3-phase micro controller relay, designed for above application in 144x144 case for flush mounting with rear plug-in connectors. 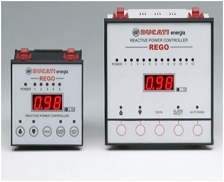 The REGO reactive power controller is designed to control and regulate capacitor banks. It operates on the basis of microprocessor technology, which provides accurate, reliable power factor measurements. The power factor is controlled by switching capacitor banks according to the reactive power requirements of the load. The controller features both automatic and manual operating modes. In addition, the powers associated with the steps can be automatically acquired due to the “Auto Acquisition” function. The G8 PLUS controller has been designed to satisfy technical characteristics of modern electrical installations in industry and of new users' needs. Main power factor controller characteristics include: reliability, capability of working in all conditions and the ability to detect critical operating conditions and all this to protect the power factor correction system.